I first met Lexi, a young college student, when she worked part-time in my department. She has a joyful spirit that shines brighter than the sun. Aware that I have a relative with Multiple Sclerosis (MS), she asked me one day about the disease, the symptoms, and what resources are available. I shared all the information I knew. Shortly thereafter she came to me and told me she was diagnosed with MS. My heart sank. The first year her and her family joined my team on the MS Walk. The next few years her family did the walk with a team they created called MS Is BS, but Lexi was unable to participate. Unfortunately, she had lost full mobility in her right leg. Through the MS Society she received a wireless computer-enabled device from an anonymous donor called a NESS (neuromuscular-electrical-stimulation-system). She wears part of the device like a necklace and another part goes in her shoe near her ankle. When she swings her leg forward, a sensor in her shoe signals the microprocessor, which sends an electrical pulse to the nerve that controls the foot, lifting it, and allowing her to walk more smoothly. I call her bionic woman. 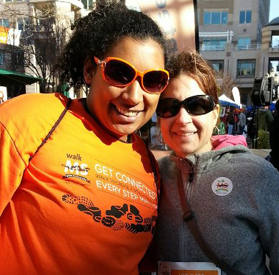 Using the NESS and her incredible natural drive, Lexi participated in the MS Walk this year!!! I was honored to join her on the journey. The three mile course of dirt, gravel and concrete up and down some steep areas would be challenging for anyone – she kept saying aloud “I can do this.” She needed a wheelchair at some points, but did a majority of the walk arm-in-arm with her boyfriend. Along the way her mom beamed with pride and would say to her dad “look, look, look at Lexi walk!” Her team members of family and friends cheered for her as she walked through the finish line. It was a day of positivity that I will never forget.